An innovative 3 step daily regime for fine hair and reduced volume, that provides instant volume and root lift, maintains optimum hair and scalp health from the inside out and encourages healthy hair growth. TRICHOTHERAPY® is a unique, holistic approach to hair care that should form part of your daily hair and scalp regime. To help get the best from TRICHOTHERAPY®, it should be used in conjunction with a healthy and balanced diet and lifestyle. The hair density formula helps to reduce hair fall caused by breakage when combing. It Improves overall hair condition, is rich in primary anti-oxidants, and helps to moisturize and improve shine, fullness, cuticle integrity and strength. Organic Quinoa Protein contains high levels of all 8 of the essential amino acids that help to repair damage, protect the cuticle, and condition the hair. Its unique molecular weight provides enhanced penetration, so the hair is left fully hydrated, strong, silky and shiny. Directions: Apply to towel dried, clean hair. Spray through generously and then gently comb through, starting at the ends of your hair and working up to your roots. Use daily. The daily scalp drops contain a combination of 7 unique trichologically selected ingredients that have taken 7 years to develop, research, test and perfect. It is rich in anti-oxidants, has soothing effects, protects against environmental degradation and immediately gives the appearance of more volume. Directions: Apply 2.5ml with the pipette, evenly across the crown and front area of the scalp and distribute with fingertips. Do not rinse. Use daily. The food supplement contains an exceptional mix of vitamins and minerals including the essential amino acids L-Lysine and Methionine, and hair essential nutrients such as Iron, Vitamins D3, C & B12. The formula also contains Zinc, Biotin and Selenium which contribute to the maintenance of normal, healthy hair and Copper which contributes to normal hair pigmentation. Inspired by a unique combination of vitamins and minerals that are prescribed on a daily basis by world-leading trichologists at the Philip Kingsley Trichological Clinics in London and New York. Directions: Take 2 tablets per day with food (ideally breakfast). After 4 months reduce to 1 tablet per day. 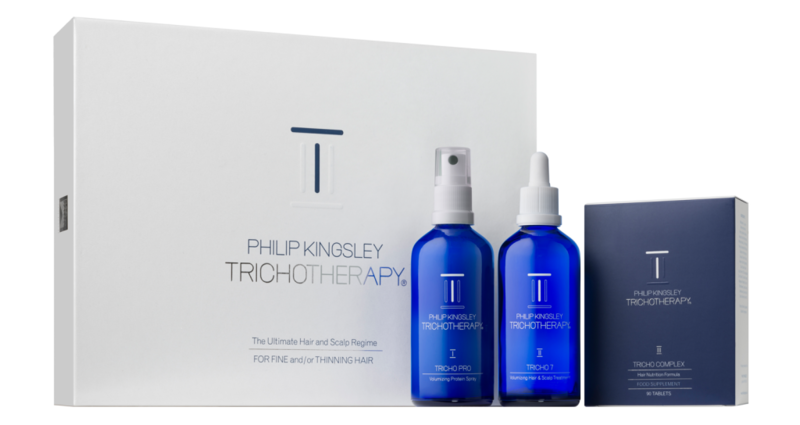 The TRICHOTHERAPY® Hair & Scalp Regime consists of 3 innovative products to help maintain optimum hair and scalp health from the inside out, and helps to reduce hair fall, caused by breakage when combing. 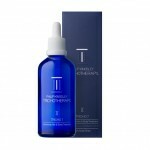 The TRICHOTHERAPY® Regime provides 6 weeks usage. Results should be seen within 6-12 weeks. TRICHOTHERAPY® is designed for long term use and should form part of your daily hair and scalp regime for best and continuous results. Suitable for use on colour treated hair. Ideal for fine and/or thinning hair, as well as anybody looking to get the best from their hair. Regular use of Elasticizer treatments, as well as the TRICHOTHERAPY® Regime contributes to the overall condition of the hair. Should you need to replenish any item in the kit, all products are available to purchase as a kit or separately. All available from Ipswich Trichology Hair & Scalp Clinic, call us on 01473 400049 today for your demonstration.